Objective To investigate the potential beneficial and adverse effects of frusemide to prevent or treat acute renal failure in adults. Data sources Cochrane controlled trials register (2005 issue 4), Embase, and Medline (1966 to 1 February 2006), without language restrictions. Review methods Two reviewers checked the quality of the studies and independently extracted data. Results Nine randomised controlled trials totalling 849 patients with or at risk of acute renal failure were included. Outcome measures not significantly different after frusemide treatment were in-hospital mortality (relative risk 1.11, 95% confidence interval 0.92 to 1.33), risk for requiring renal replacement therapy or dialysis (0.99, 0.80 to 1.22), number of dialysis sessions required (weight mean difference - 0.48 sessions, - 1.45 to 0.50), and proportion of patients with persistent oliguria (urine output < 500 ml/day: 0.54, 0.18 to 1.61). Stratifying studies that used frusemide to prevent or treat acute renal failure did not change the results on mortality (relative risk ratio 2.10, 95% confidence interval 0.67 to 6.63) and the risk for requiring dialysis (4.12, 0.46 to 37.2). Evidence suggested an increased risk of temporary deafness and tinnitus in patients treated with high doses of frusemide (relative risk 3.97, 95% confidence interval 1.00 to 15.78). Conclusions Frusemide is not associated with any significant clinical benefits in the prevention and treatment of acute renal failure in adults. High doses may be associated with an increased risk of ototoxicity. No large randomised controlled trials or meta-analyses have evaluated the role of frusemide in acute renal failure. Frusemide is frequently used to facilitate fluid and electrolyte management of acute renal failure in many institutions,2 yet its potential benefits, adverse effects, and cost effectiveness to prevent or treat acute renal failure remain uncertain. We carried out a meta-analysis to assess the potential beneficial and harmful effects of frusemide in acute renal failure and whether effects differ when used to prevent or to treat acute renal failure. We searched the Cochrane controlled trials register (2005 issue 4), Embase, and Medline (1966 to 1 February 2006) for randomised controlled clinical trials comparing frusemide with placebo in adults using the exploded MeSH terms “frusemide”, “furosemide”, “loop diuretic”, or “lasix” with “renal failure”, “renal impairment”, “dialysis”, “renal support”, “hemodiafiltration”, “hemofiltration”, “hemodialysis”, or “renal replacement therapy”. We also included studies of single dose frusemide compared with prolonged continuous infusion. We excluded studies comparing two different modes of frusemide administration such as regular boluses with continuous infusions. As the causes and treatment of acute renal failure in children differ from those in adults we excluded studies of children only. The search was further limited to clinical trials, letters, and randomised controlled trials. We also searched the reference lists of related reviews and original articles for relevant trials. To ensure that all suitable studies were included we also searched the websites of the International Network of Agencies of Health Technology Assessment and International Society of Technology Assessment in Health Care. We found no studies published that were not in English. Two reviewers (KMH, DJS) independently examined the titles and abstracts of all identified trials to confirm fulfilment of inclusion criteria. They recorded the trial characteristics and outcomes independently, using a predesigned data abstraction form. This form was used to record information on the quality of the trial such as allocation concealment, method of randomisation, blinding, and inclusion and exclusion criteria. The Jadad scale was used to score study quality (range 0-5, higher scales indicating better quality)7 but the component that constituted the quality of the study including blinding, allocation concealment, and intention to treat analysis were also described. Grading of allocation concealment was based on the Cochrane approach (adequate, uncertain, clearly inadequate). No disagreements occurred between the reviewers on data extracted. One study published data in two publications.8 w5 We combined these data to represent one trial. Data were checked and entered into RevMan version 4.2 (Cochrane Collaboration, 2003) for further analyses. We chose in-hospital mortality and the proportion of patients requiring renal dialysis or replacement therapy as the main outcomes for meta-analysis because they are the most relevant clinical outcomes in patients with acute renal failure. No data were missing for these two outcomes in the included studies. The other outcomes assessed were the proportion of patients remaining oliguric (urine output < 500 ml/day), proportion of patients who developed ototoxicity, number of dialysis sessions required until recovery, and length of hospital stay. Using a random effect model we report the differences in categorical outcomes between the treatment and placebo or control groups as relative risks with 95% confidence intervals. We further stratified the effects of frusemide on mortality and the need for dialysis after frusemide treatment into studies using frusemide to prevent or to treat acute renal failure, and we tested this interaction by relative risk ratio.9 Using a random effect model we report the differences in length of hospital stay and the number of dialysis sessions required as weighted mean differences. We used the χ2 statistic to assess heterogeneity between trials and the I2 statistic to assess the extent of inconsistency.10 One study reported tinnitus and deafness in several patients after frusemide treatment but did not specify the number.w5 We therefore estimated that at least three patients would have tinnitus or deafness in the frusemide group. One study reported the duration of continuous renal replacement therapy until recovery.w4 We pooled the results of this study with others that reported the total number of dialysis sessions required until recovery of renal function. We carried out sensitivity analyses by excluding one study that compared a single dose of frusemide with prolonged continuous infusionw6 or by including only studies that had adequate allocation concealment.w1-w3 w7 Publication bias was assessed by funnel plot using mortality as an end point. We considered a P value less than 0.05 as significant. The treatment protocol varied between studies. Doses of frusemide used to prevent acute renal failure were 1 mg/h or 2.5 mg/h by intravenous infusionw1 w2 or a single intravenous bolus dose of 80 mg.w3 In the treatment group doses ranged from 600-3400 mg/day in the studies that evaluated frusemide in established acute renal failure. In one of these studies,w6 the control group also received one dose of frusemide (1 g) while the treatment group received prolonged frusemide infusion (3.4 g/day) until the serum creatinine level fell spontaneously to less than 300 µmol/l. Two different doses of frusemide were assessed in two separate treatment groups in one study.w8 The criteria to initiate dialysis were described in only three studies.w5-w7 Jadad scores ranged from 1 to 5 (mean 2.6). Allocation concealment was adequate in four studies.w1-w3 w7 Double blinding was used in four studies.w1 w2 w4 w7 Three studies reported the proportion of patients who were randomised but lost to follow-up; all less than 5%. The table lists the characteristics of the included studies. No significant heterogeneity was found for in-hospital mortality and ototoxicity but heterogeneity was significant for the other outcomes. 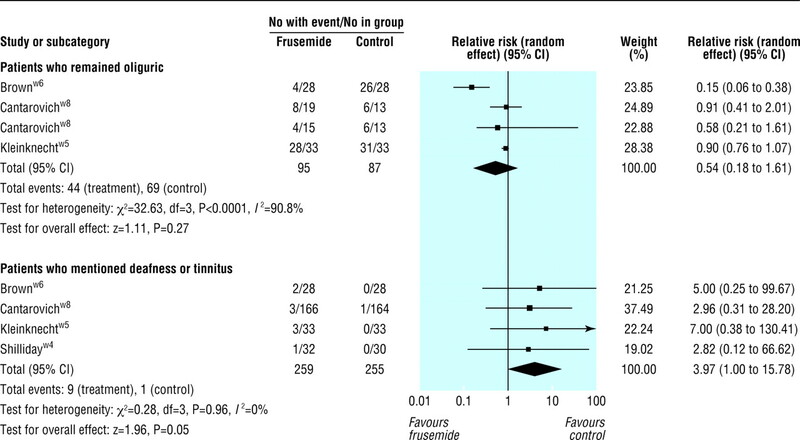 No significant reduction after frusemide treatment was found for in-hospital mortality (relative risk 1.11, 95% confidence interval 0.92 to 1.33, P = 0.28, I2 = 0%l fig 2), risk for requiring renal replacement therapy or dialysis (0.99, 0.80 to 1.22, P = 0.91, I2 = 64.2%; fig 2), number of dialysis sessions required (weighted mean difference - 0.48 sessions, −1.45 to 0.50, P = 0.34, I2 = 0%; fig 3), or proportion of patients with persistent oliguria (urine output < 500 ml/day; 0.54, 0.18 to 1.61, P = 0.27, I2 = 90.8%; fig 4). Regardless of whether frusemide was used to prevent or to treat acute renal failure no significant difference was found on the effects of mortality (relative risk ratio 2.10, 95 confidence interval 0.67 to 6.63, P = 0.20) and the proportion of patients requiring dialysis (4.12, 0.46 to 37.2, P = 0.21). 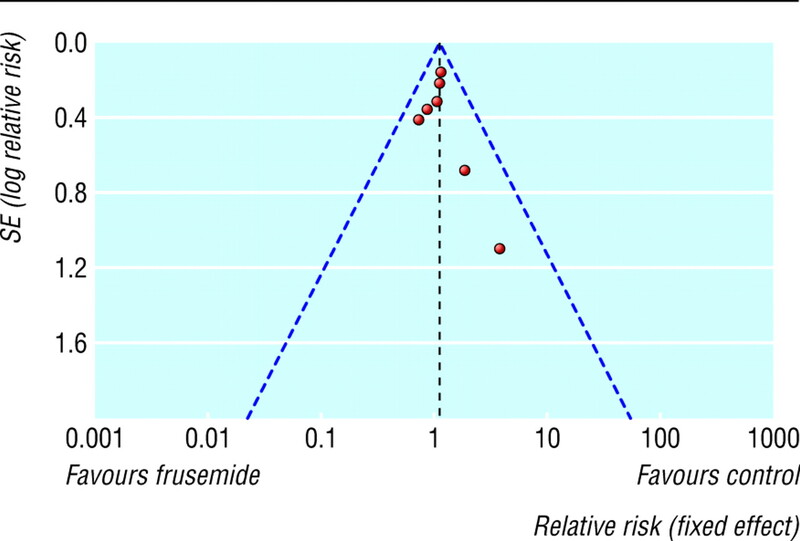 High dose frusemide (range 1-3.4 g daily) was associated with a suggestion of an increased risk of temporary deafness and tinnitus (relative risk 3.97, 95% confidence interval 1.00 to 15.78, P = 0.05, I2 = 0%; fig 4). The length of hospital stay was reported in two preventive studies.w1 w2 Frusemide treatment was associated with an increase in hospital stay (weighted mean difference 3.57 days, 95% confidence interval 0.02 to 7.12, P = 0.049, I2 = 0%). None of the studies reported a formal cost effectiveness analysis. The funnel plot showed a small possibility of publication bias, with absence of small studies showing a reduction in mortality after frusemide treatment (fig 5). Meta-analysis showed that frusemide is not effective in the prevention and treatment of acute renal failure in adults. Frusemide did not reduce in-hospital mortality, the requirement for dialysis, the number of dialysis sessions required until recovery of renal function, the proportion of patients remaining oliguric (urine output < 500 ml/day), and the length of hospital stay. Furthermore, high doses may be associated with an increased risk of ototoxicity. Frusemide has been shown to reduce renal tubular damage in experimental settings and as such has been widely used to prevent or treat acute renal failure. 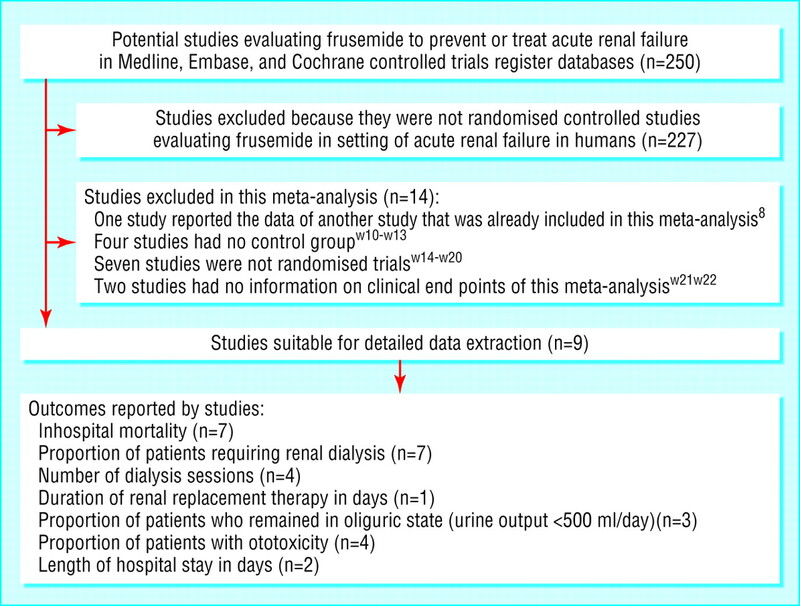 It has been argued that frusemide, especially at high doses, may convert oliguric acute renal failure to non-oliguric acute renal failure and thus reduce the requirement for dialysis.w7 w14 This meta-analysis did not show these potential benefits. As frusemide is largely excreted unchanged in the urine and influences tubular reabsorption from the luminal side, it is the urinary excretion of the drug, not its plasma concentration, that determines the efficacy of its diuretic action.11 12 Non-oliguric acute renal failure is in general associated with a better prognosis than oliguric acute renal failure,5 and studies have shown that patients who have diuretic responses to frusemide have less severe acute renal failure.w4 Therefore a positive diuretic response to frusemide may indicate that patients have a milder form of acute renal failure rather than frusemide being capable of converting a more severe form of acute renal failure to a less severe form and improve the outcome.w4 13 Our results agree with this hypothesis. Frusemide, especially at high doses, is associated with important side effects. Previous observational studies have produced conflicting results about frusemide's association with mortality.2 6 We did not find any significant increase in mortality after frusemide treatment. High doses of frusemide (1-3.4 g daily) may, however, be associated with an increased risk of ototoxicity. Frusemide is primarily excreted by the kidneys and high doses can increase its serum concentration substantially in acute renal failure12 w8 and hence the higher risk of ototoxicity. Most of the symptoms of ototoxicity reported by the patients in the pooled studies resolved after treatment was stopped. Nevertheless, sedated and ventilated patients with acute renal failure in the intensive care unit would not be able to communicate their symptoms of ototoxicity and, as such, high doses of frusemide potentially may be more dangerous. Firstly, meta-analyses are prone to bias, and study quality can affect the direction and magnitude of treatment effect. In the pooled studies only four trials had adequate allocation concealmentw1-w3 w7 and four had a Jadad score of 3 or more.w1 w2 w4 w7 The magnitude and direction of the results was not changed in sensitivity analysis by including only the four studies with adequate allocation concealment. 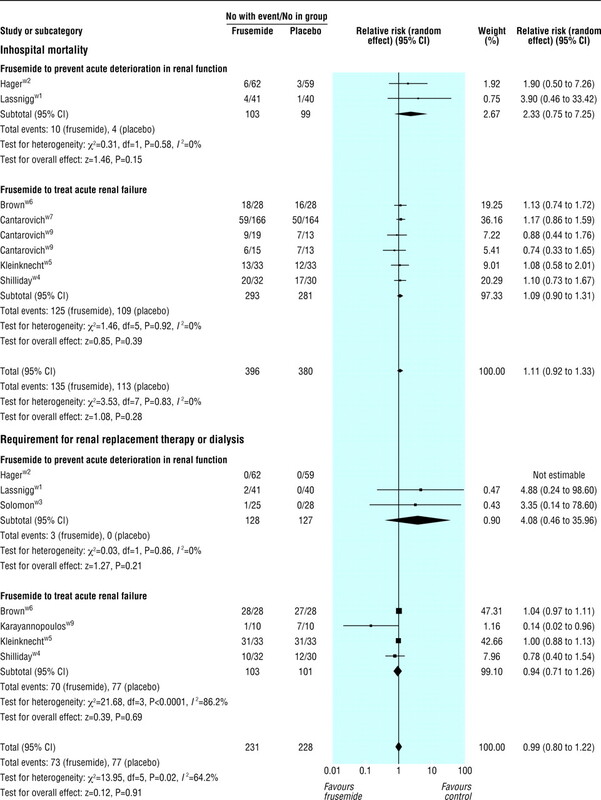 Furthermore, the number of patients included in this meta-analysis may be inadequate to exclude small but significant clinical benefits of frusemide. With the sample size of this meta-analysis (204 patients when considering requirement for renal dialysis as an end point in established acute renal failure), a positive protective effect of frusemide on the risk for requiring dialysis can only be shown if the associated relative risk reduction exceeds 30%. If frusemide can reduce the relative risk for requiring dialysis by only 20%, a sample size of 400 patients would be required to show such an effect if the baseline risk for requiring dialysis is 70% in the control group. Secondly, with the absence of small studies showing a reduction in mortality after the use of frusemide small publication bias was possible (fig 5). This apparent bias is unusual because it implies a lack of published studies with positive results. The asymmetrical shape of the funnel plot could be the result of the small number of studies included in this meta-analysis rather than true publication bias.14 Finally, although the results of this meta-analysis were largely consistent across the studies included, significant differences were found in how frusemide was given. The benefits of a particular dose or mode of administration remain uncertain because of the small number of studies included in this meta-analysis. Contributors KMH and DJS searched the literature search, extracted the data, and drafted the manuscripts. KMH carried out the statistical analyses. DJS initiated the idea of the meta-analysis. KMH is guarantor. Funding Department of Intensive Care, Royal Perth Hospital. Competing interests: None declared. et al. Acute renal failure in critically ill patients: a multinational, multicenter study. JAMA 2005;294: 813–8. et al. Diuretics and mortality in acute renal failure. Crit Care Med 2004;32: 1669–77.
. Determinants of intrarenal oxygenation. I. Effects of diuretics. Am J Physiol 1994;267(6 Pt 2): F1059–62.
. Loop diuretics reduce hypoxic damage to proximal tubules of the isolated perfused rat kidney. Kidney Int 1994;45: 981–5.
. Prognostic patterns in acute renal failure: the New York Hospital, 1981-1982. Clin Exp Dial Apheresis 1983;7: 145–67.
. Diuretics, mortality, and nonrecovery of renal function in acute renal failure. JAMA 2002;288: 2547–53. et al. Assessing the quality of reports of randomized clinical trials: is blinding necessary Control Clin Trials 1996;17: 1–12.
. High-dose frusemide in renal failure. [Letter.] BMJ 1974;290: 244–5.
. Interaction revisited: the difference between two estimates. BMJ 2003;326: 219.
. How do loop diuretics act? Drugs 1991;41(suppl 3): 1–13.
. The pharmacokinetics and pharmacodynamics of furosemide in anesthetized dogs with normal and experimentally decreased renal function. Nippon Juigaku Zasshi 1990;52: 265–73.
. Clinical predictors of acute renal replacement therapy in critically ill patients with acute renal impairment. Crit Care Resusc 2003;5: 97–102.
. In an empirical evaluation of the funnel plot, researchers could not visually identify publication bias. J Clin Epidemiol 2005;58: 894–901.